The war in neighboring Syria hasn't engulfed Jordan, but it's been bad for tourism. Jordan may no longer be hyper-vulnerable and under siege, as it was in decades past; but it does face possibly unprecedented problems. Created out of thin air by Winston Churchill in 1921 to accommodate British imperial interests, the Emirate of Transjordan, now the Hashemite Kingdom of Jordan, for almost a century has led a precarious existence. Particularly dangerous moments came in 1967, when Pan-Arabist pressures led King Hussein (r. 1952-99) to make war on Israel and lose the West Bank; in 1970, when a Palestinian revolt nearly toppled him; and 1990-91, when pro-Saddam Hussein sentiments pushed him to join a hopeless and evil cause. 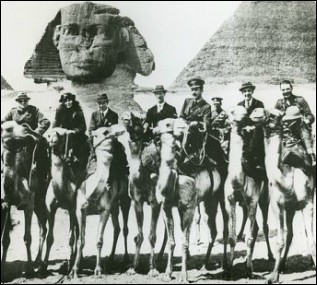 Winston Churchill (far left) taking time off from creating Transjordan in 1921. Today's dangers are manifold. 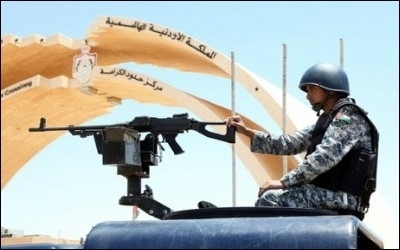 ISIS lurks in Syria and Iraq, just beyond the border, attractive to a small but real minority of Jordanians. The once-robust trade with those two countries has nearly collapsed – and with it, Jordan's lucrative transit role. In a region bountiful in oil and gas, Jordan is one of the very few countries to have almost no petroleum resources. City-dwellers receive water just one day a week and country-dwellers often even less. Tourism has declined thanks to the Middle East's notorious volatility. The king's recent assertion of authority grates on those demanding more democracy. The core issue of identity remains unresolved. As a country of massive and repeated immigration for over a hundred years (even exceeding the numbers going to Israel), it has received waves of Palestinians (in 1948-49, 1967, and 1990-91), Iraqis (2003), and Syrians (since 2011). Palestinians, most estimates find, constitute a substantial majority of the country's population; they also present the deepest division. It's common to speak of "Jordanians" and "Palestinians" even though the latter are citizens and the grandchildren of citizens. As this suggests, the sense of being separate from and superior to the mostly tribal peoples of the East Bank has not diminished over time, and especially not when Palestinians have achieved economic success. Though no longer hyper-vulnerable and under siege, Jordan faces unprecedented problems. The country's strengths are also formidable. Surrounded by crises, the population is realist and very wary of trouble. The king enjoys an undisputed position of authority. Intermarriages are eroding the historic division of the country between Palestinians and tribals – something the influx of Iraqis and Syrians further erodes. The population enjoys a high level of education. Jordan enjoys a good reputation around the world. Then there's Israel. "Where are the fruits of peace?" is a common refrain about Jordan's 1994 treaty with Israel. 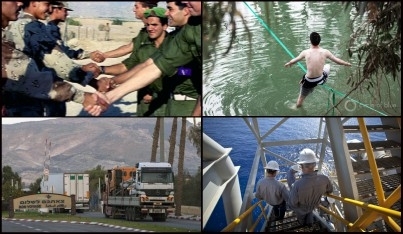 Politicians and press may not say so, but the answer is blindingly obvious: whether it's using Haifa as an alternative to the Syrian land route, the purchase of inexpensive water, or the provision of plentiful gas (which is already being delivered), Jordan benefits directly and substantially from its ties with Israel. Despite this, a perverse social pressure against "normalization" with Israel has grown over time, intimidating absolutely everyone and preventing relations with the Jewish state from reaching their potential. Though few openly admit it, Jordanians benefit directly and substantially from ties with Israel. One Jordanian asked me why Israelis accept being treated like a mistress. The answer is clear: because Jordan's welfare ranks as a paramount Israeli priority, so successive governments accept, even if through gritted teeth, the calumnies and lies told about it in the press and on the streets. Though they are too polite to say so, they clearly wish the king would take hold of this issue and point to the benefits of peace. On a personal note: since 2005, I have been advocating for "Jordan to the West Bank, Egypt to Gaza: The Three-State Solution" as a way to solve the Palestinian problem. Accordingly, I asked nearly all of my 15 interlocutors (who represented a wide range of viewpoints) about a return of Jordanian sovereignty to the West Bank. I regret to report that every one of them thunderingly rejected this idea. "Why," they all seemed to say, "would we want that headache?" Accepting their negative verdict means Israel has no practical solution to its West Bank conundrum, so its reluctant and unwanted sovereignty over Palestinians will likely continue into the distant future. Summing up the visit: Jordan has muddled through many crises, it may do so again, but the concatenation of current dangers pose an extraordinary challenge to Jordan and its many well-wishers. Will King Abdullah cope with those "dire straits"?